Home Tags Posts tagged with "diversity"
Southern’s very first recipients of The Top Owl Award – the November Top Owls — were honored at the Social Justice Month closing event in November. 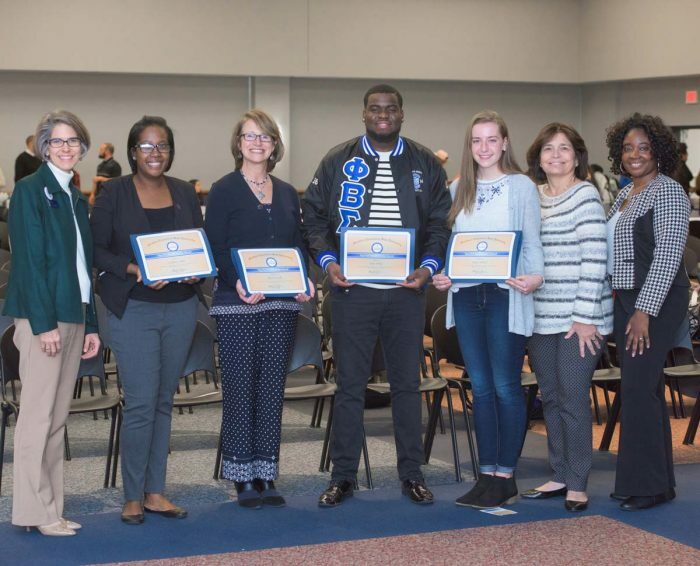 Those recognized were Barbara Cook, assistant professor of communication disorders; Daphney Alston, assistant director of clubs and organizations; student Sean Wilder, and student Jessie Holman. Deborah Weiss, professor of communication disorders, nominated Cook, writing that Cook “has run numerous educational sessions for students, faculty, and staff on autism and other disabilities in order to facilitate the inclusion and acceptance of individuals with disabilities on our campus. She continuously seeks new information and research that will improve the lives of those with disabilities in order to incorporate this knowledge in her teaching and her clinical work in the Center for Communication Disorders. The December Top Owls included Anna Rivera-Alfaro, academic and career advising; student Haroon Chaudhry; and Jessica Powell, assistant professor of education and co-director of the Urban Education Fellows Program. Alfaro was nominated by both Christine Barrett, associate director of academic advisement, and Jordan Jones, adviser in interdisciplinary studies. Barrett wrote in her nomination that Rivera-Alfaro “exemplifies cores values of social justice in her work as the advisor to the Organization of Latin American students since 2008.” Beyond the university, Barrett wrote, Rivera-Alfaro’s community involvement includes providing free tax preparation and Spanish translation services to low-income families through a School of Business program; representing Southern at local Latino college fairs; doing college outreach to Latino communities in Meriden and New Haven; and currently researching the possibility of SCSU hosting the annual New England Latinx Student Leadership Conference, among other activities. To nominate a member of the Southern community for a Top Owl Award, visit the Social Justice website.